For ten years of my husband’s ministry, we lived in a parsonage with a pond out back. The delightful view from the kitchen window made dishwashing a much more pleasant task. Light and shadow played on grass, trees, and water, creating an ever-changing scene. Wading birds grazed the edges–herons, egrets, and wood storks. Anhingas and ducks enjoyed an occasional swim. To appreciate their performance even more, consider that the eyes of ducks are on the sides of their heads. Can they even see well straight ahead? Oh, that I could be like those little ducks, responding to God’s leading with split-second precision. “The Lord will guide you always; he will satisfy your needs in a sun-scorched land and will strengthen your frame. You will be like a well-watered garden like a spring whose waters never fail (Isaiah 58:11). “Do not set your heart on what you will eat or drink; do not worry about it…Seek his kingdom and these things will be given to you as well” (Luke 11:29-31). “If God is for us, who can be against us? He who did not spare his own Son but gave him up for us all–how will he not also, along with him, graciously give us all things?” (Romans 8:31-32). I’m beginning to understand what happens. When worry, self-doubt, and fear occupy my mind, I’m allowing my emotions to take the lead, not the truths of scriptures. Lousy leaders, those emotions. I need to become more aware of my thought life–not let my mind just roam around helter-skelter. Paul used military terminology to describe our course of action. That makes sense, since spiritual warfare does occur in the mind. Paul said, “Take captive every thought to make it obedient to Christ” (2 Corinthians 10:5). I like the way Eugene Peterson interprets that verse: “We…fit every loose thought and emotion and impulse into the structure of life shaped by Christ”(The Message). The scriptures mentioned above would be good places to start. I can write key phrases on 3×5 cards or slips of paper and stash them here and there–on a mirror, in a dresser drawer, on the car visor, in the refrigerator! (Yes, in! That ought to grab my attention!) Over time I would expect these memory-joggers to train my brain toward positivity and faith. The day may come when I won’t even need the reminders anymore. When my thoughts line up and follow Christ’s leading, so will my emotions. Imagine the peace, joy, and contentment! Great analogy. 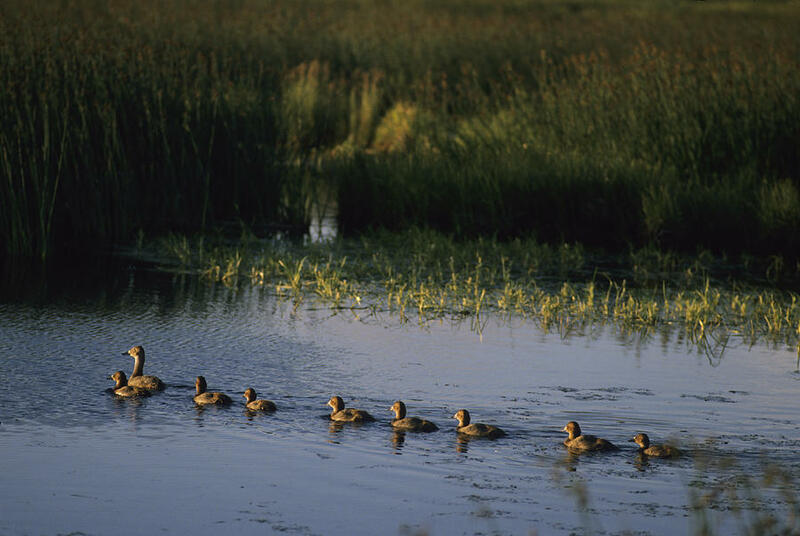 The ducklings follow the mother duck so closely because they know she knows…they trust her. Why wouldn’t we try to align our thoughts and actions to the One who knows everything?! Exactly! Your rhetorical question speaks great wisdom and logic! Thanks, Gail, for your input. “The day may come when I won’t even need the reminders anymore. When my thoughts line up and follow Christ’s leading, so will my emotions.” A beautiful thought, that! Wonderful picture here, Nancy. There are abundant lessons to be pondered from the seemingly simple things in nature, yes? Have a blessed weekend! Thank you, Rebeca. Yes, God has surrounded us with reminders and lessons throughout nature. I love making the discoveries–evidently you do, too! My weekend IS off to a blessed start–a fun S.S. class party last night and NO obligations for today!! Blessings to you, too! Love the catchy title ‘Pond-erings’! Excellent post! You have pin-pointed perfectly that my emotions mess with my faith; the devil uses every trick in the book to get between me and my Savior. I had never thought of my own emotions being used against me in quite this way before. As you stated above “When my thoughts line up and follow Christ’s leading, so will my emotions.” A truly wondrous reassurance. Thanks, again, dear friend. You are so right: the devil uses very trick he can to get between us and Jesus, including manipulating our emotions. ‘So delighted the post was meaningful to you. And as for “dear friend” — right back at you, Cheri! Your explanation of the surroundings in the pond, takes me back when I had a pond and looked at the delightful creations God created. I miss that pond, but now and then vision it in my mind. Thanks for sharing your experience. God bless you dear Nancy. 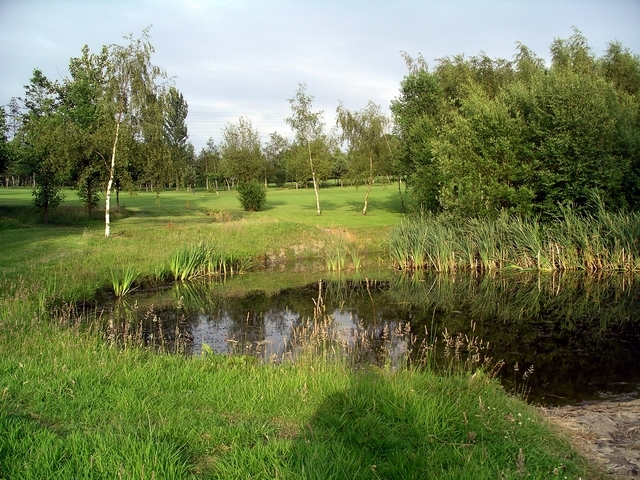 You’re right about being able to enjoy the memories of our ponds. With a bit of effort, I can bring ours back–in my imagination. Thank you for stopping by, Laura!